Power electronics module offers a constant current / constant voltage (CC/CV) source with SPI control in a board mounted component module. The Allied Component Works ICM14001 is a modular DC-DC converter primarily intended to directly source a regulated current of up to 10A to non-linear loads such as LEDs, laser diodes, thermoelectric devices, and more. Constant voltage control of up to 12V at the output provides a flexible upper limit to load voltage. Regulation parameters are configurable from within an embedded design by addressing the module as a serial peripheral interface (SPI) slave device. Input voltage range is 10V to 32V, dependent in part on load requirements. The ICM14001 is fundamentally a non-isolated current mode synchronous buck regulator in a standard ‘eighth-brick’ size with a similar pin configuration. An independent voltage and current limit can be established while allowing operation outside of compliance with either limit (CC/CV operation). This allows direct connection to nonlinear loads for which current regulation is required. It can also provide a fixed nominal voltage to a load that may experience a large inrush or occasional short circuit without loss of control. The SPI slave port allows a host processor to configure the output limits and enables, or to monitor the actual output voltage, current, and temperature of the module. 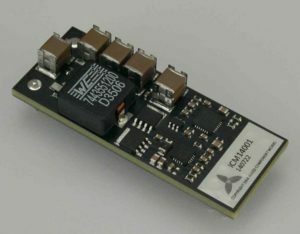 The module was developed in part to provide a very unique function in an industry standard footprint, but also to develop the processes necessary to reliably and cost effectively mass produce a power electronics subsystem for a niche market in a board mountable component module. The product is available now on our product showcase.